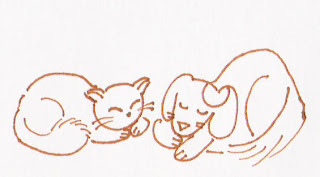 This sketch was very simple - more of a doodle - that was inspired after I finished meditating one morning. The feeling I had was simply amazing, and I just had to sketch it out, even if it looked kiddish and simplistic. 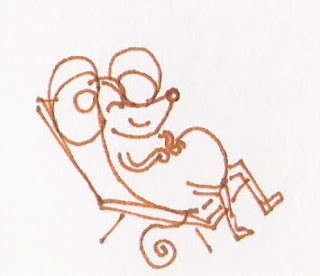 And even the rat is filled with bliss. The sentiment captured in this drawing is something I'll never forget, even though it isn't the most skillful drawing. The poem I wrote was spontaneous and simply came out of the creative spirit in me that knew no boundaries. 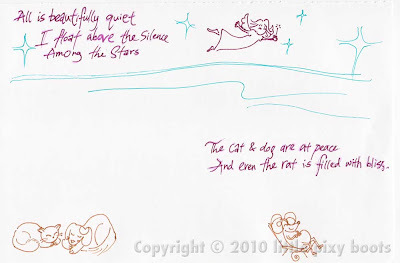 The silence in this sketch reminds me of the person who taught me to meditate. He's the one I'm most grateful for, in the whole of my life. What a gift he gave me - peace and silence in my heart. 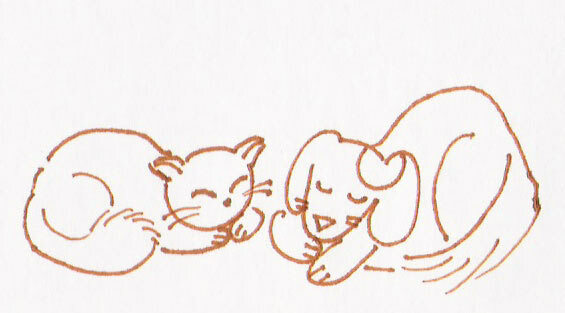 I love the way I drew the cat and dog. They reflected the contentment in my heart. I love my sketch, even if it's not portfolio quality. Perhaps one day I will make a "portfolio" quality picture out of this to wow the world. 1. See my other animal illustrations here. 2. What other illustrations have I submitted to Illustration Friday?